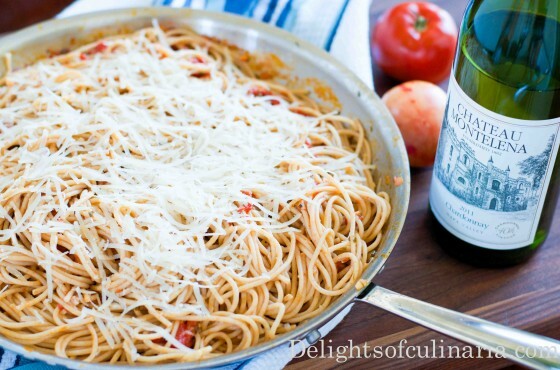 What I like about pasta dish is …. it’s really quick and easy to prepare,looks mouthwatering and fancy, and always delicious! 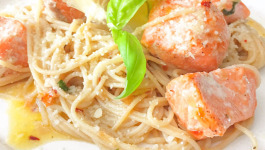 This salmon pasta dish is light and tasty. 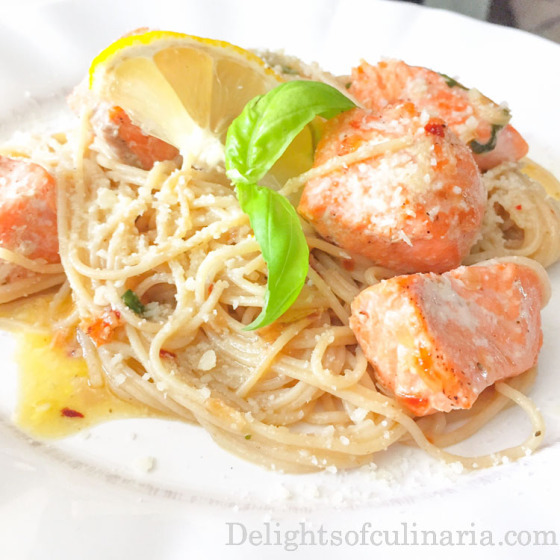 Capellini pasta and tender salmon chunks tossed in creamy buttery wine sauce with a hint of lemon and touch of fire (red pepper flakes). Cook your choice of capellini pasta according to package instruction. I used whole wheat. Season salmon chunks with salt and pepper. Set aside. Heat a medium-large pan on medium heat. Add oil and 1 tablespoon butter. Add shallots and garlic. Saute for about 1 minute. Arrange salmon chunks on the pan. Cook both sides for about 2 minutes per side. Add chopped basil between fish pieces. Bring the heat to high,and carefully add white wine. Cook for about 30 seconds to one minute. Pour in heavy whipping cream and add hot pepper flakes. Add parmesan cheese and season with salt. Turn off heat. Carefully stir in remaining 2 tablespoon butter. Careful not to brake delicate fish pieces. Add cooked pasta to the pan and gently toss. Drizzle with little bit of lemon and sprinkle parmesan cheese before serving. Carefully stir 2 tableblespoons butter. Careful not to brake delicate fish pieces. 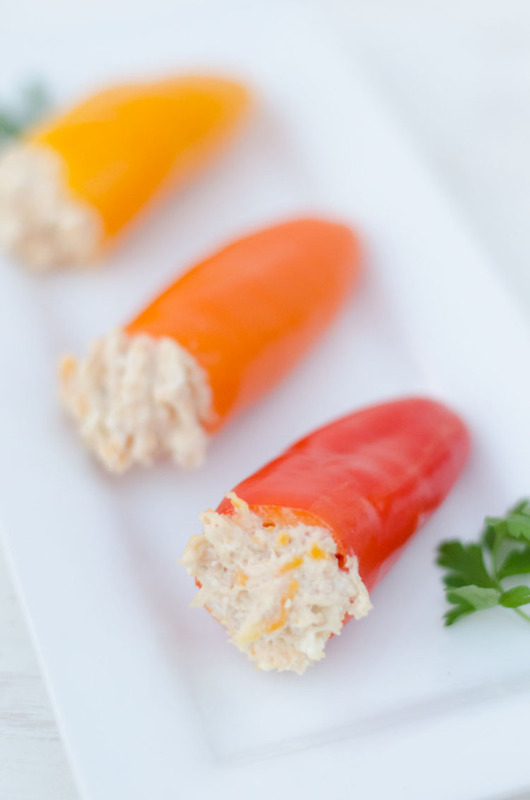 These stuffed mini peppers are a quick and easy appetizer or snack. No cooking or baking required. Just mix the chicken filling and stuff the peppers. 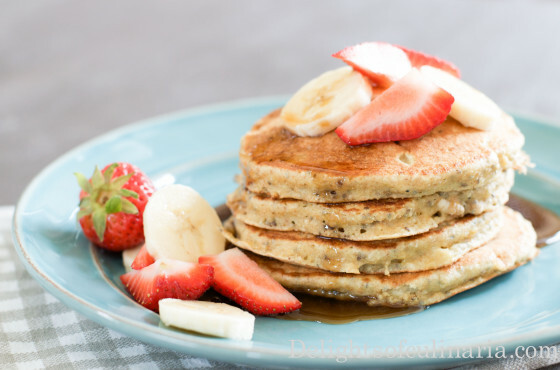 It’s really easy to make and delicious! 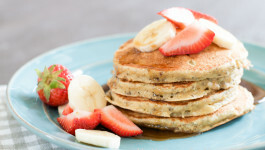 Mix all the ingredients together using a kitchen aid or hand blender. 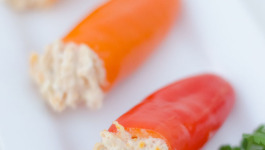 Stuff mini peppers with chicken and cheese filling. 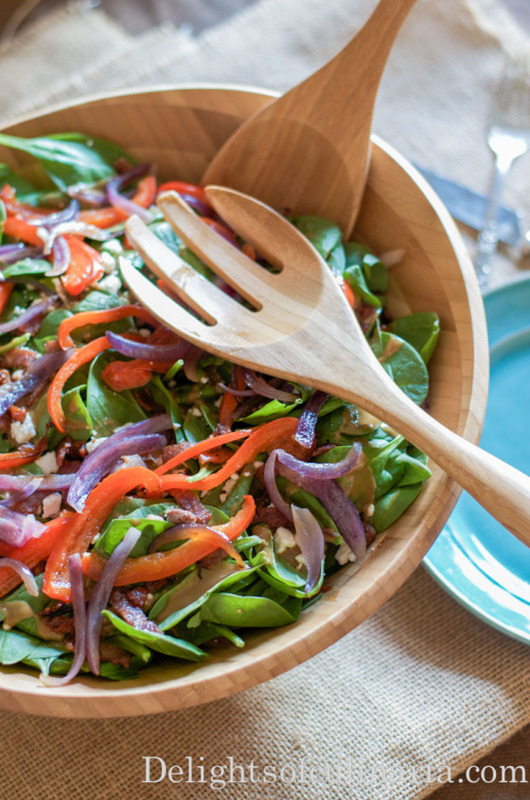 This Spinach salad is delicious, healthy, and vibrant. It’s one of the most requested salads that I bring to potlucks. So I make this salad often. 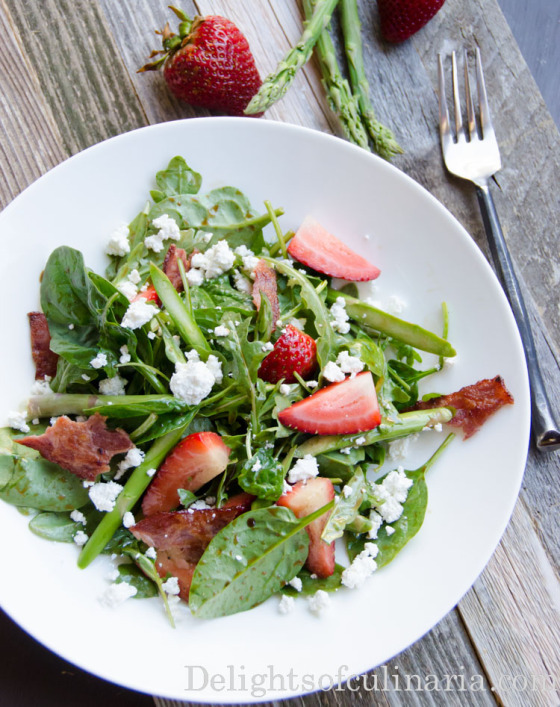 This beautiful salad will look great on your holiday dinner table. For a great tasting vinaigrette try using good quality balsamic vinegar, olive oil , and mustard. Using a hand blender, Combine balsamic vinegar,shallot,garlic,mustard,salt,and pepper. With blender running,slowly pour in oil. Continue to blend until vinaigrette thickens. If too thick, you can add a little water to adjust thickness to your liking. Adjust seasoning and sweetness if needed. 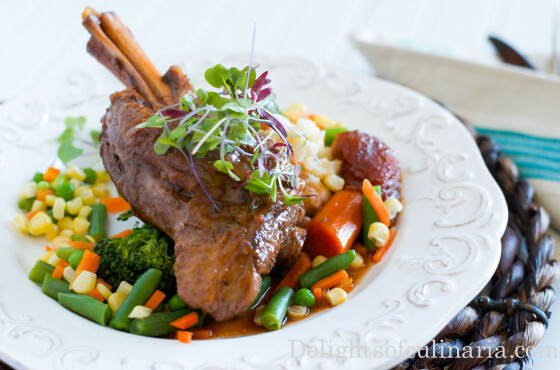 Let sit at room temperature for at least 30 minutes. Heat 2 tbsp.oil in a skillet on med-high heat. Add bell pepper and saute. Remove a peppers from skillet. Add 2 tbsp. oil. to the same skillet. If serving in a large salad bowl, Arrange in layers by repeating the order. 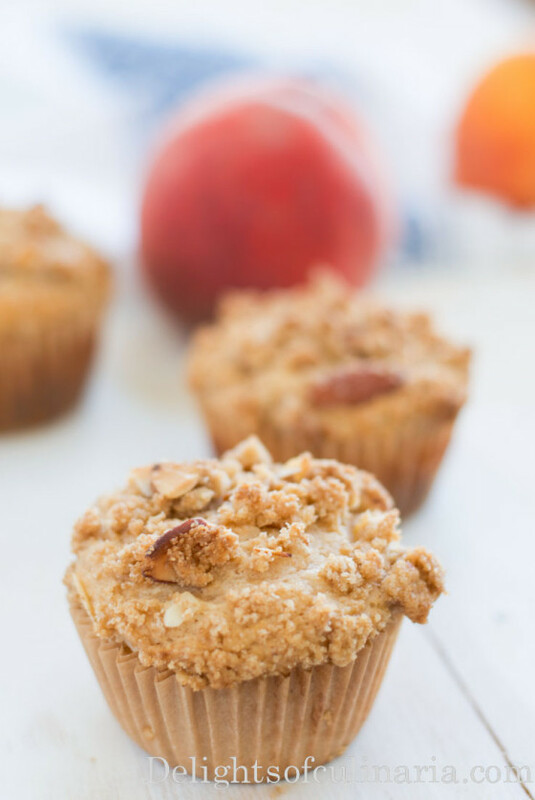 Sweet and tender cake-like peach muffins with crunchy and buttery almond crumble.These Peach muffins can be a delightful breakfast or dessert treat when peaches are in season. 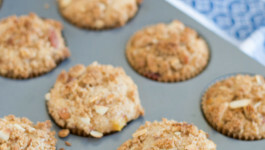 *you can sub in walnuts for almonds, and regular granulated sugar for brown sugar. 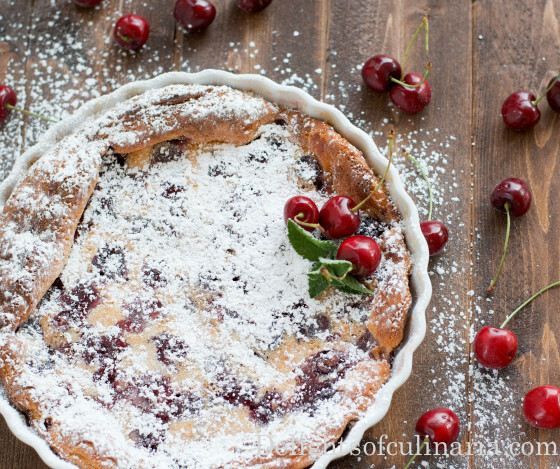 In a bowl, whisk together flour,sugar,salt,baking powder and cinnamon(optional). In another bowl,whisk together eggs,yoghurt,milk,oil, and vanilla. 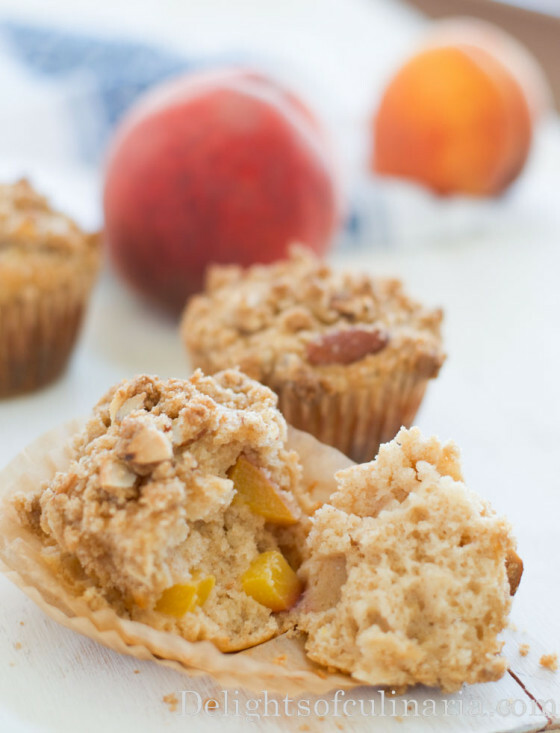 Combine wet ingredients with dry ingredients and mix in peaches. Line a cupcake pan or a muffin pan with liners. Spoon batter in to each liner 3/4 full. In a medium bowl using fork or your hands mix all crumble ingredients. 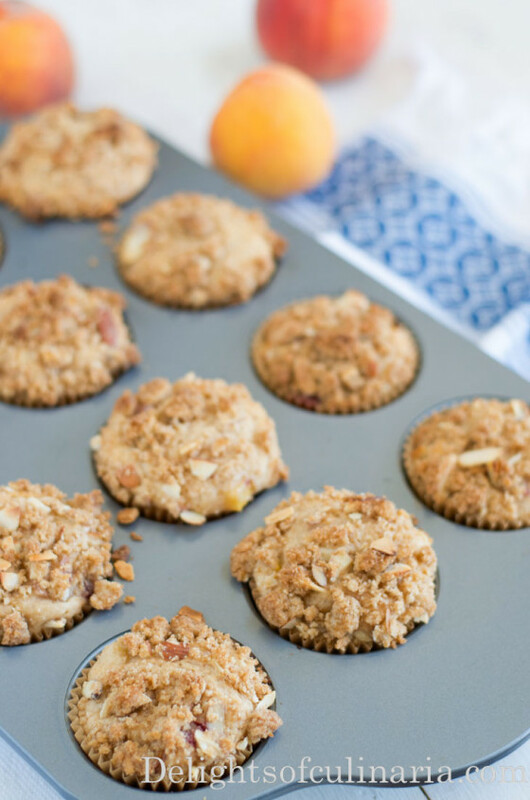 Top muffin batter with generous amount of almond crumble. 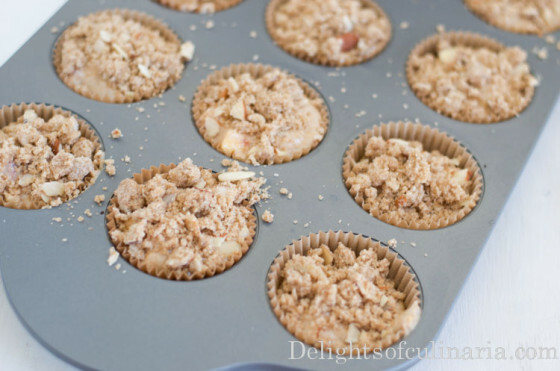 Bake for 15-17 minutes if using cupcake pan or 22-24 minutes if using muffin pan. My moms garden is in abundance of tomatoes every summer.And every time when I have a lot of something,I think of a way how to use it in a perfect way.Making pasta with fresh tomato sauce is great way to use those extra tomatoes.This pasta sauce is so easy and quick to make ,that you will have a healthy and amazingly delicious lunch or dinner in no time. Directions: Cut a small X on the bottom of each tomato.Place tomatoes in a pot or a bowl and cover with boiling water. Cover with lid and blanch for 5 minutes. Carefully peel of the skin and roughly chop the tomatoes. Heat a saute pan and add oil. Throw in onions and garlic and cook for 2 minutes.Pour in chardonnay and let it evaporate for about a minute.Add tomatoes,basil and parsley.Cook sauce until thickened,about 10-12 minutes.Season with salt and pepper. 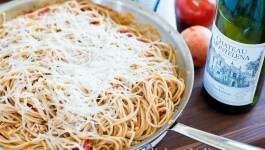 Combine cooked pasta with sauce and sprinkle some parmesan cheese. 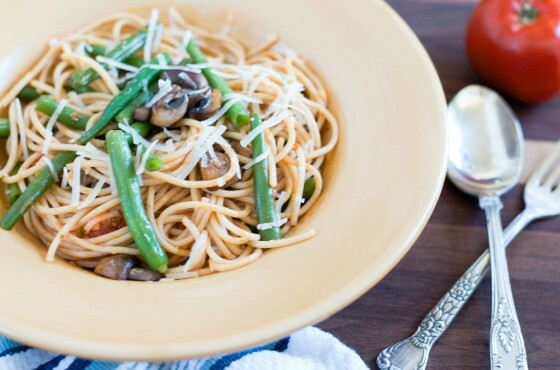 You can add yourchoice of sautéed or grilled vegetables to pasta. Cut a small X on the bottom of each tomato.Place tomatoes in a pot or a bowl and cover with boiling water. Cover with lid and blanch for 5 minutes. 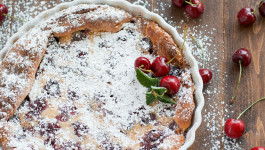 Pour the custard over cherries and bake for 1hour - 1 hour and 15 minutes.The custard should be lightly browned and firm to touch when done. 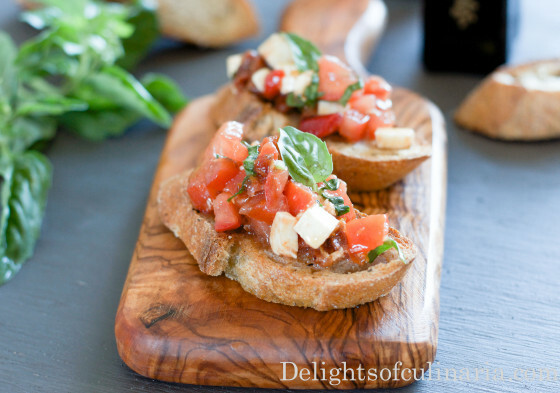 Bruschetta is one of my favorite summer appetizers.It’s one of the freshest,simplest, and healthiest appetizers out there(no frying or mayo). 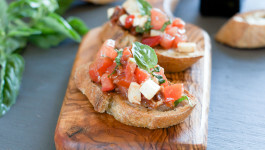 The combination of sweet tomatoes and aromatic basil with tangy sweet balsamic and olive oil is simply divine.Great thing about bruschetta… that it can be served as an appetizer,snack,salad or lunch.Whatever you’re in the mood for.And at parties they’re are gone in a zoom! Arrange bread slices on a lined baking sheet. Drizzle some olive oil and sprinkle a little salt and black pepper. Toast in the oven for 3-5 minutes or until bread is slightly browned.Let cool. In a bowl, combine tomatoes,mozzarella cheese,basil,sun-dried tomatoes,fire roasted peppers,salt,balsamic vinegar,and olive oil.Set aside. Rub each piece of bread with garlic. Spoon tomato mix on top of each slice of bread. 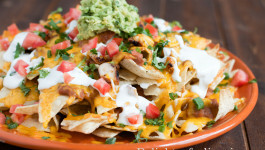 It won’t take a long time for these Grande Nachos to become your family favorite.A large platter of crisp tortilla chips loaded with seasoned chicken,hearty beans,cheese,tomatoes,sour cream and green onion. And to elevate it to a more SUPREME level, Add some fresh guacamole,jalapeño and cilantro. This recipe was inspired by my awesome sister Dasha. She served them as appetizer,and made a big crowd rush to the table. 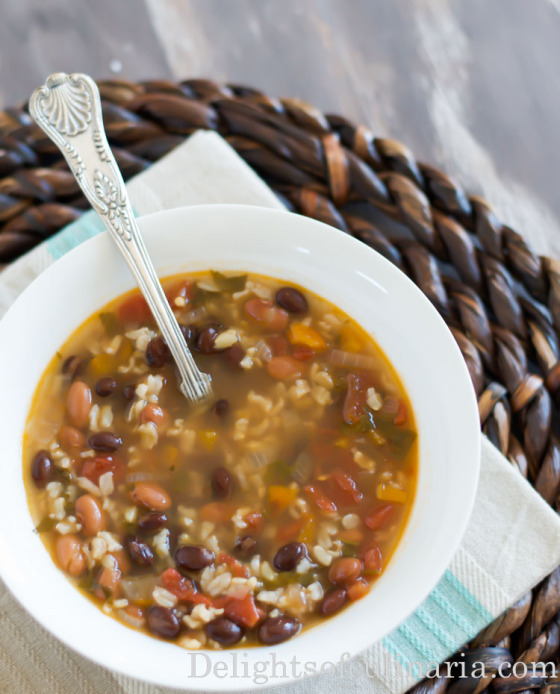 You can omit chicken to make it vegetarian and use steak or ground meat instead of chicken. * you can sub in your favorite chicken seasoning. Combine salt,pepper,cumin,chili powder,garlic powder,oil,and lemon/lime juice. Add marinade to chicken breast and let it marinate for 15 minutes. Cut the chicken in small-medium cubes. Arrange first layer of chips on oven safe platter. Heat oven on 350 degrees. Place the arranged platter in the oven for about 10 minutes or until cheese is melted. 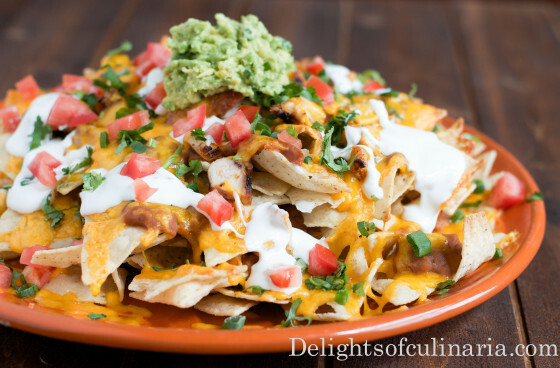 Top with sour cream,tomatoes,jalapeños,green onions,cilantro,and guacamole or diced avocado. 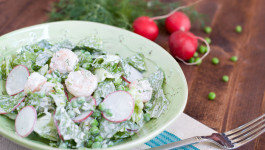 Spring and summer are my favorite seasons.Everything around you looks amazingly beautiful, fresh and full of life.This shrimp spring salad consists of leafy romaine lettuce, radish, sweet peas and shrimp.All the ingredients are tossed with creamy garlicky dill dressing.It’s very tasty and easy to make for any occasion.Even though the dressing is creamy, salad feels very light but filling. In a small bowl,whisk all dressing ingredients and set aside. 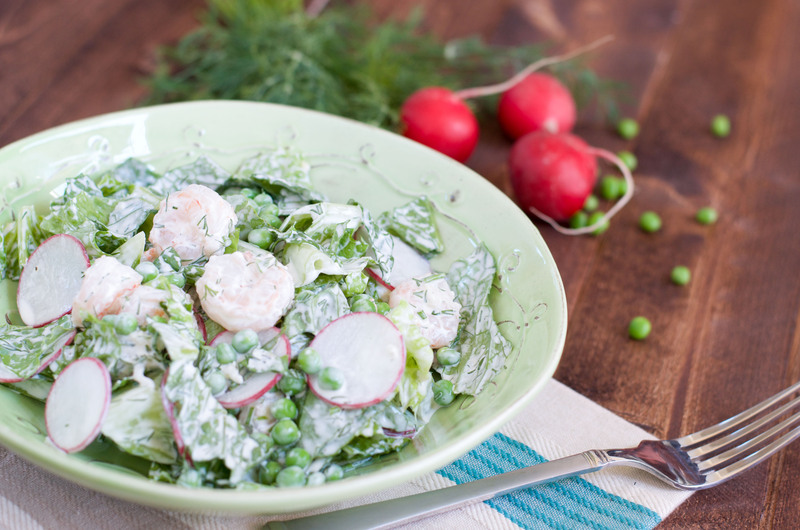 Place romaine lettuce,radis,pesa,and shrimp in mixing bowl. Toss salad with garlic dill dressing. Russian/Ukrainian kotleti to Slavic people is like chicken nuggets to Americans.We all grew up on them.It’s one of those Moms famous foods that are perfect as party food or everyday meal. 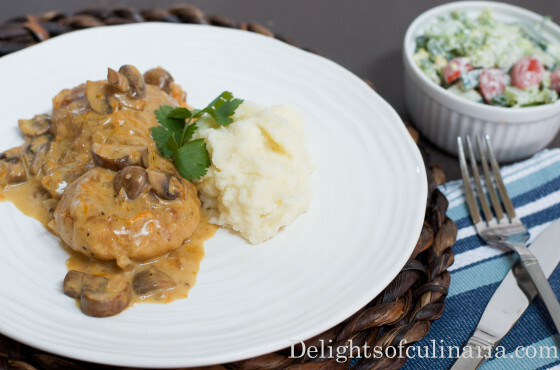 They are tender,juicy, and well seasoned chicken patties that are fried and steamed or fried and simmered in creamy mushroom sauce.Creamy mushroom sauce can be served as gravy also.Always perfect.Always delicious! *Or 3-4 lbs ground chicken meat. * You can make it with out chicken broth,just add more cream and omit flour.The best pizza seasoning for this sauce is from winco (bulk section).I tried from other stores,It’s a little different. Grind chicken thighs and breast. Soak bread slices in milk and set a side. Saute onions with carrots until soft. Press through grinder and add to chicken. Squeeze bread from milk.Press through grinder and add to chicken. Add potatoes,mayonnaise,salt and pepper to chicken. Mix everything well, hitting the meat against the bowl( at least 20 times). Shape them in to preferred size patties. Heat a frying pan with about 1/2 inch oil ( I use extra light olive oil or avocado oil). Dredge each patty in breadcrumbs . 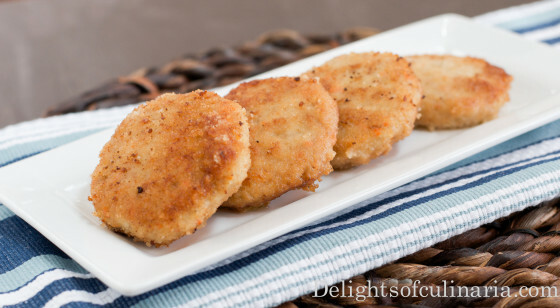 Fry patties in batches on both sides until golden brown. 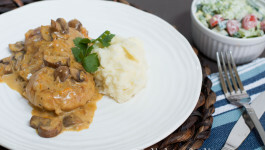 If you’re not serving kotleti/patties with mushroom sauce, arrange fried patties in a baking dish or a medium saucepan. I add onions,peppercorns,and bay leaf to the bottom (it’s optional).Pour a small amount of water or chicken broth over patties/kotleti,about 1/2 -3/4 inch from the bottom. If using baking method;heat oven to 350 degrees and bake for about 20-25 minutes. If using stovetop method; bring to a boil then reduce to low and steam for about 10 minutes.This makes kotleti juicy. Melt butter in a saute pan on medium heat. Throw in onions.Saute onions until soft.Transfer to a bowl or plate. Add more butter if needed and sauté carrots for couple of minutes.Transfer to plate with onions. Add more butter and sauté mushrooms. Transfer onions and carrots back to a sauté pan with mushrooms,and mix in flour.Cook for about 15 seconds. Gradually and gently whisk in chicken broth by dribbles at first.Sauce will thicken.Add heavy whipping cream and pizza seasoning.Season with salt.Turn off the heat. 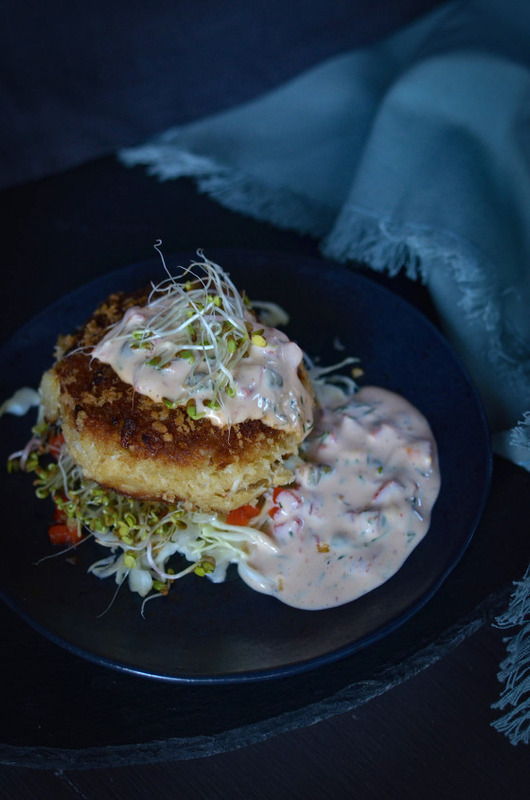 Arrange patties in a medium saucepan and pour the mushroom sauce over kotleti/patties. 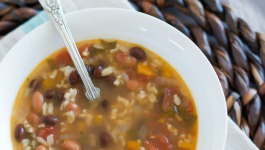 Let them simmer on low heat for about 10 minutes.Serve with mashed potatoes,pasta or rice. * You can make it with out chicken broth,just add more cream and omit flour.The best pizza seasoning for this sauce is from winco (bulk section).I tried from other stores,It's a little different. 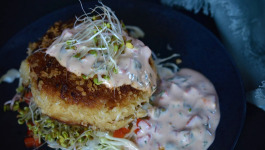 If you're not serving kotleti/patties with mushroom sauce, arrange fried patties in a baking dish or a medium saucepan. I add onions,peppercorns,and bay leaf to the bottom (it's optional).Pour a small amount of water or chicken broth over patties/kotleti,about 1/2 -3/4 inch from the bottom. If using baking method;heat oven to 350 degrees and bake for about 20-25 minutes. If using stovetop method; bring to a boil then reduce to low and steam for about 10 minutes.This makes kotleti juicy. 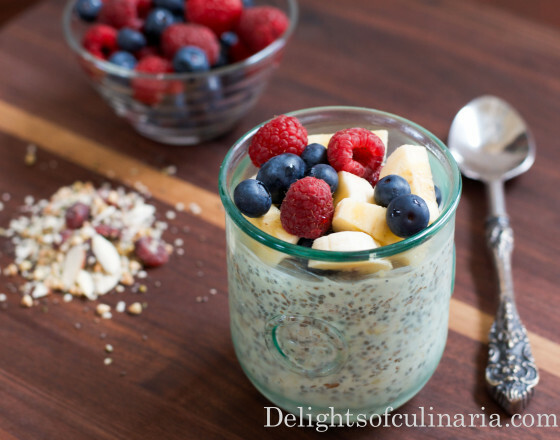 I don’t know of healthier breakfast then overnight oats with buckwheat.A filling,delicious,and nutritious breakfast with superfood ingredients and tons of health benefits.Can it get better then that??? Overnight oats are oats soaked overnight in liquid such as milk(any kind).I like to add buckwheat and other super foods to give it an extra boost.They are very versatile and made with variety of ingredients,flavorings,and fruits. If not using Natures Path’s superfood cereal, you will need to use raw (light green)buckwheat, not roasted. Using raw ingredients known as “live food” has more health benefits because, when food is heated over 118 degrees F. most of the food nutrients are destroyed.Eating more raw food gives you more energy and amazing health results. 2 tablespoons maple syrup,honey,agave,or condensed milk. 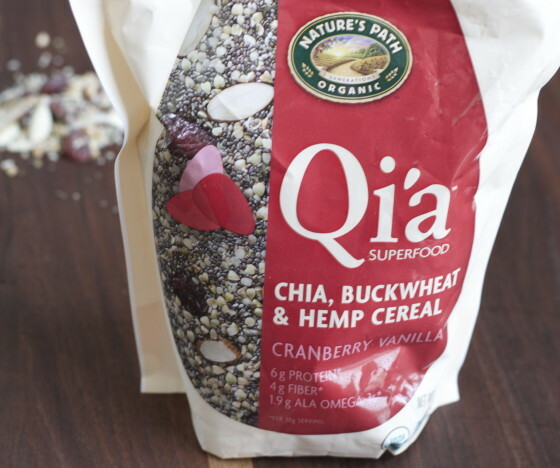 *You can make your own;just add raw buckwheat,chia seeds,hemp seeds,almonds,and cranberries. 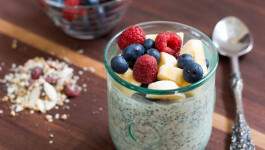 Place all the ingredients (except fruit) in a glass jar such as mason jar or any other glass container.Stir to combine all the ingredients.Cover with lid and refrigerate overnight.When ready to serve, top with fruit and berries and more nuts or chia seeds if desired.If you like more liquid in your oats add more milk and adjust sweetness to your liking. *You can make your own ,just add raw buckwheat,chia seeds,hemp seeds,almonds,and cranberries. 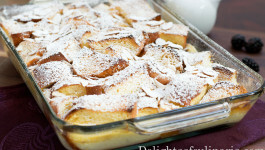 This is a scrumptious and special breakfast casserole that can be made ahead.This French toast casserole has a crunchy top with custardy bread filling.You can simply cover the bread in casserole dish with plastic wrap,and whisk all the ingredients for the custard then cover and refrigerate until morning.Or if you like it to be pudding like ,you can pour the custard over bread and refrigerate overnight. 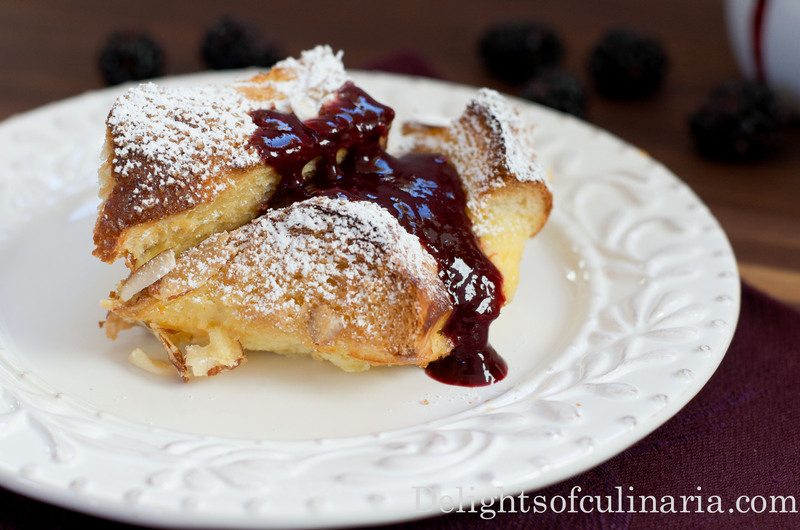 I made this casserole last week for sisters brunch, and it was a big hit.I served it with delicious blackberry sauce,and that made it even more special.Mmmmmm!!! * You can use french bread or any other lightly sweetened specialty bread. Note: If you like your sauce to be thicker, add 1 teaspoon cornstarch to water. *You can mix 1/4 cup water + 1/4 cup orange juice and reduce the amount sugar. Slice bread in to large chunks and arrange all pieces of bread in the glass baking dish or casserole dish.Sprinkle a little of turbinado sugar over the top of bread. In a mixing bowl,whisk eggs with salt.Add cream,milk,sugar,orange zest,orange juice,and orange liqueuer. Whisk to incorporate all the ingredients. 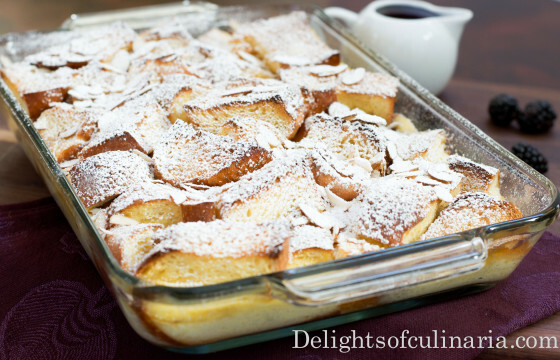 Pour the custard mixture over bread.Sprinkle sliced almonds over the bread. Cover with foil and bake covered for about 30-35 minutes.Remove foil and continue to bake until the top is light golden brown ( about another 25-30 minutes).When ready to serve, dust with powdered sugar and add more almonds if desired. 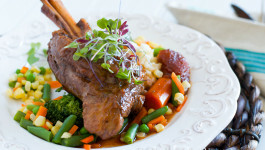 Serve with warm maple sauce,homemade syrup with cinnamon,or blackberry sauce. Place blackberry in a blender.Pulse until well blended.Press the sauce through fine mesh strainer to remove the seeds.Add sugar,orange zest,cinnamon,water/orange juice blackberries. Heat the sauce in a sauce pan on medium heat.Let it simmer for about 3-5 minutes.Whisk in orange liqueuer. 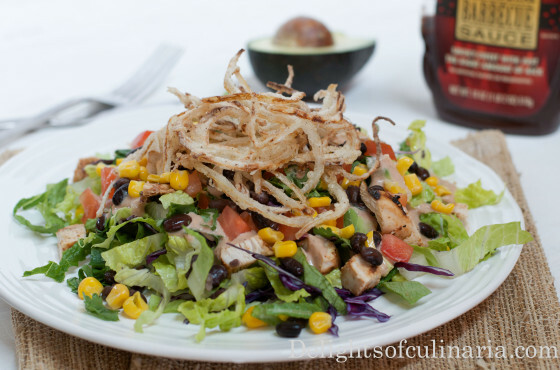 Absolutely amazing,delicious and filling BBQ ranch chicken salad. 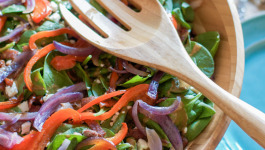 This salad got so many of my of favorite ingredients especially fresh crispy onion strings. 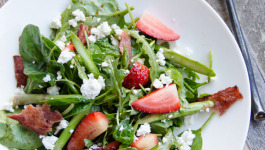 You can refer this salad as a copycat recipe from Cheesecake Factory. I love to order this salad whenever we go there or Thai lettuce wraps substituted with grilled portable mushrooms for chicken.It’s the best! so fresh,crunchy,and healthy. BBQ ranch: Whisk all ingredients set a side or refrigerate. Chicken: Mix seasoning/marinade ingredients. Add it to chicken. Bake,grill or use electric grill (such as George Foreman) to cook chicken.When chicken is done let it rest for 3-5 minutes.Cut into bite size cubes. Onions: Cover sliced onions with water and set a side for 10 minutes.Fill heavy pot or deep skillet with oil about 3/4 – 1 inch from the bottom and heat it on high heat. Combine corn starch with salt and pepper.Drain the water from onions and separate into single rounds .Add corn starch mix to the onions and mix. When oil is really hot,using tongs fry onions in small batches until lightly golden brown. 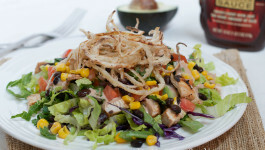 Arrange salad ingredients on a salad plate or bowl.Add diced chicken.Top with onion strings and drizzle with BBQ ranch dressing. Onions: Cover sliced onions with water and set a side for 10 minutes.Fill heavy pot or deep skillet with oil about 3/4 - 1 inch from the bottom and heat it on high heat.